January - Refit in Rosyth. 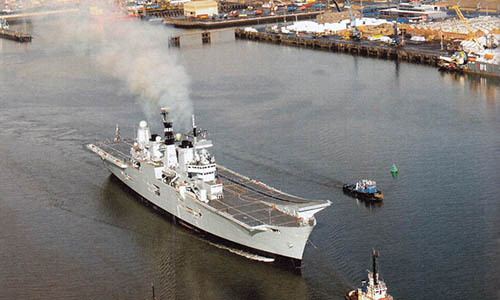 May - Refit in Rosyth. 1st June - Ship's Staff Move On Board Date. 11th July - Captain Mike Mansergh joins as Commanding Officer. July - Harbour Acceptance Trials in Rosyth. August - Refit in Rosyth. 28th September - Ready For Sea Date Inspection. 29th September - Sail from Rosyth to commence Sea Acceptance Trials. 24th? - 26th October - Ammunition ship at Crombie Ammunition Depot. 13th? November - Sail for weapons and aviation trials. 8th December - Fleet Date Inspection. 11th December - Sail for Shakedown and sea trials. 22nd December - Portsmouth for Christmas leave.